Welcome to Todd McLellan’s unique photographic vision of the material world: fifty design classics—arranged first by size and then by intricacy—are beautifully displayed, piece by piece, exploding in midair and dissected in real-time, frame-by-frame video stills.This book makes visible the inner workings of some of the world’s most iconic designs. From SLR camera to mantel clock to espresso machine, from iPad to bicycle to grand piano, every single component of each object is revealed. 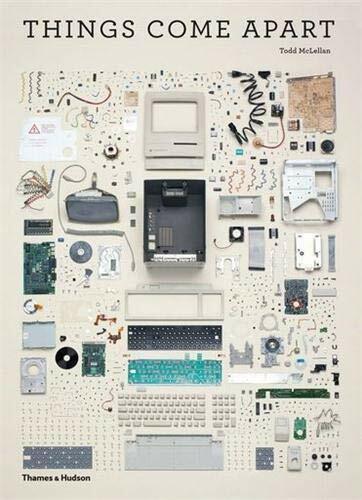 These disassembled objects show that even the most intricate of modern technologies can be broken down and understood, while beautifully illustrating the quality and elegance of older designs. Stunning photography is interspersed with essays by notable figures from the worlds of restoration, DIY, and design innovation who discuss historical examples of teardowns, disassembly, and reverse-engineering.Each photograph is itself a work of art and offers a reinterpretation of our familiar world. They connect people with the child-like joy of taking something apart to see how it works and will appeal to anyone with a curiosity about the material world.